Hey, friends! 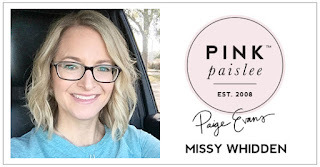 Happy Tuesday :) I have a new layout to share for the Paige Evans Design Team. This page features a lot of the Pick-Me-Up Stickers and Chipboard Stickers. I began this page with Paige’s Geometric Flower Background cut file. I almost used it as a stencil, but I decided to use it over a mixed media background. I chose a few colors of ink sprays that matched the deeper colors in the Pick-Me-Up collection. After adding some white gesso, I used the packaging technique with the sprays as well as directly spraying right onto the paper. I glued the cut file right over it for a fun background design. I embellished with a lot of Pick-Me-Up goodies. I backed the centers of the flowers with Pick-Me-Up Paper 02. I wanted to highlight the deep red orange, dark blue, softer pink, and yellow tones. I used a row of three photos and layered some bits of Pick-Me-Up Paper 01 and Paper 24 behind them to add some pops of color. I also tucked in some pieces from the Pick-Me-Up Chipboard Stickers and Stickers. I added a bit more texture and color with some tangled thread. I created my title using a Pick-Me-Up Sticker and navy Mini Thickers. I created a fun little cluster down below the photos using more Stickers. I fussy cut the “Hello Sweetness” piece from Paper 01. I love how all these pieces look layered together. I touched the area up with a few Chipboard Sticker hearts. I added my journaling down below the title. Instead of stamping the date, I created it using the Pick-Me-Up Stickers and then stitched through it. I couldn't resist adding some splatters of Gold Color Shine :) A lot of the embellishments I used have gold foil on them, so I thought it would look pretty. I created a little interest at the bottom of the page by cutting a crooked piece of the white cardstock out. I backed it with a striped patterned paper to pull in all of the colors I used above. I topped it with one of the die cut flowers. I love the white-on-white look. It creates interest without being too busy or distracting. I decided to use three of these framed stickers. I kind of just went for it and chose a lot of stickers I hadn't used yet. It’s really fun to begin a layout with a cut file in mind or a specific set of embellishments. I knew I wanted to focus on the Stickers & Chipboard Stickers as well as the cut file, so this helped me get my page started. It helps to limit what you’ll use so it’s not so overwhelming when there is a lot of product to choose from. Be sure to check out my process video here to see how I put this all together.